The State Visits the Village: Are Personnel Changes Possible? The following article is an editorial. I have tried to present the facts as I know them in as unbiased a manner possible, but I do have a bias, as you will discover below. Please weigh in with your comments! An auditor from the State of Michigan Department of Treasury paid a visit to the Village Office this week. According to Village president Reggie Manville, reached by phone today, this was not the normal annual state-required auditor visit, which usually occurs in May, but a special visit to examine Village finances. The state Treasury Department’s press office confirmed that an auditor had met with village representatives “for a couple of hours to discuss the financial condition of the village and the village officials’ plans to rectify it,” but would not give any details. After a couple of years of staying within budget and taking some positive steps to trim the Village’s general fund balance deficit (still over $500,000), this year the Village exceeded its budget by tens of thousands of dollars, both through repairs and updates to the Life Saving Station and legal bills from the litigation surrounding Loy Putney’s acquisition of the Bay Valley Inn. * In addition, the Village lost tax revenue when it took possession of the former Thorpe property, now known as Elberta Dunes South. Rumors of a special meeting to be held October 10 circulated yesterday. The meeting had not been posted as of this morning, but Reggie confirmed that he has called a meeting for the 10th at 7pm at the Village Community Building to discuss a 5-year plan to trim costs. State treasury representatives will not be present at the meeting on the 10th but will be at the regular council meeting on the 17th, at which time they expect the Village to have a finalized plan, Reggie said. What will those cuts consist in? Department of Public Works head Ken Bonney said today by phone that Manville told him yesterday that he was considering contracting with Frankfort for DPW services. This would eliminate Bonney’s position and that of newly hired DPW assistant Corey Toms. Another rumor I heard yesterday was that Village Clerk Sharyn Bower might have her hours cut to one day a week. I was not able to confirm whether this option is being considered. Reggie said he came prepared for this week’s meeting with the auditor with a preliminary plan. I was not able to get details of the meeting or the auditor’s name from Reggie, Laura Manville (village treasurer), or the Treasury Department. Laura said the auditor’s report would probably be available in a couple of days. The Village’s financial situation has been a topic of concern for many years at this point, and has been blamed on cost overruns and legal fees associated with the departure of the SS City of Milwaukee and the creation of the Waterfront Park as well as loss of tax revenue. Former council member Bill Soper agitated for cuts to office personnel and/or hours last year as a means of cutting costs, pointing out that other area municipalities get by with office staff that work as little as three days a week. At the August council meeting, council voted down Linda Manville’s motion to require Village employees to begin paying 20% toward their monthly health insurance premiums, which is now an option by state law. The vote was 3 to 2: Reggie Manville, Ken Holmes, and Joyce Gatrell no, Diane Jenks and Linda Manville yes. Jennifer Wilkins and Matt Stapleton were absent from that meeting. Reggie Manville said at the time there was no conflict of interest in his deliberating on this proposal, even though it directly affects his household: Reggie and Laura are married and cohabitate. Reggie is not only a member of the Village Budget Committee, but is also on its Employee Relations Committee. According to the July Village Treasurer’s report the two DPW employees, at that time Ken Bonney and Charlie Hendershott, earned a total of $4,404.75 for a combined 269 hours, whereas the office (Sharyn and Laura) earned $4,341.84 for a combined 256 hours of work. Ken Bonney said today that current figures for the DPW with new employee Corey Toms show a total of 84 hours a week costing the Village $1,075/wk total. Ken said the Village is spending no more money on DPW with Toms than it did before, because Bonney no longer has to put in for overtime. 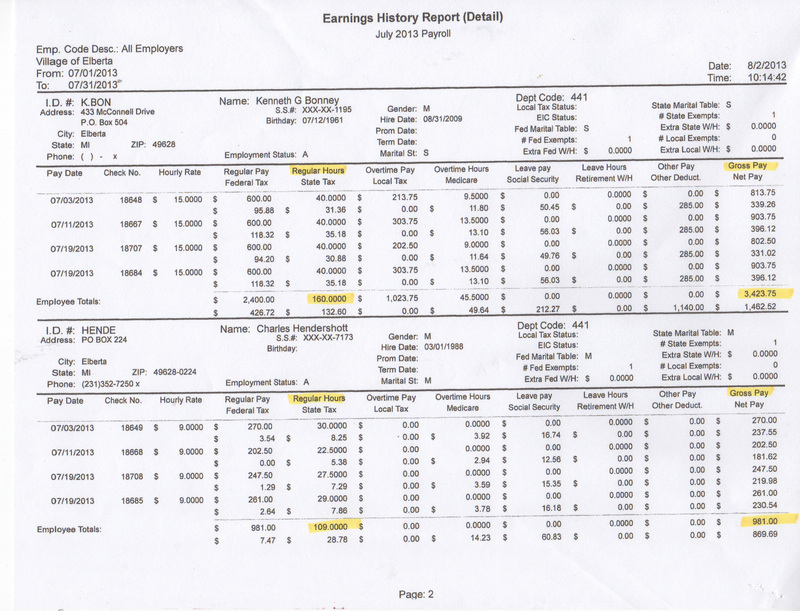 Ken Bonney earns $15 an hour; Toms makes $10. 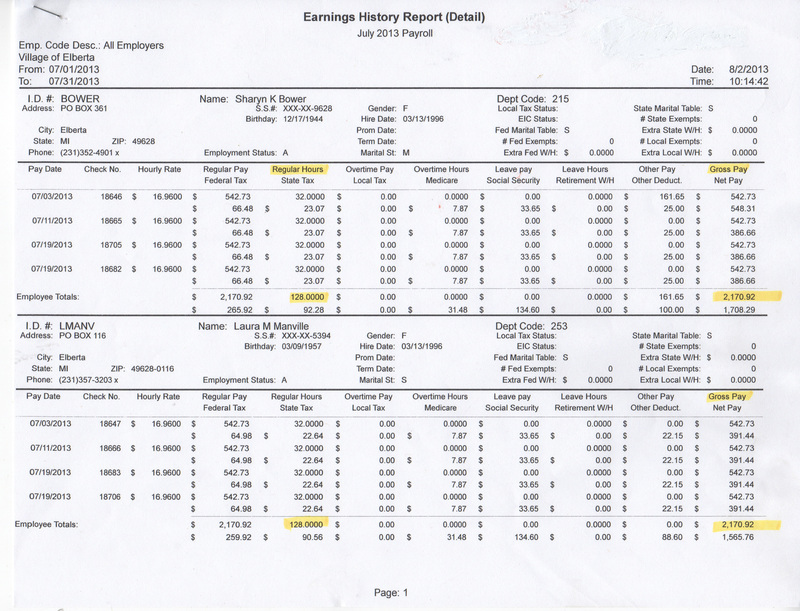 Sharyn Bower and Laura Manville each earn $16.96 an hour. In a grim bit of irony, Sharyn’s overwork these days is in part due to the lack of a readily available hard copy of the Village’s zoning ordinance, which formed a key claim in Loy Putney’s initial lawsuit against the Village. Judge Batzer said during the January 4, 2012, hearing, “I will declare that it is the obligation of the Village of Elberta to have copies of their zoning ordinance, complete copies available, and I don’t care if they don’t have them there on paper. They can print them off the computer at will within a matter of seconds. But they have to make copies available to any member of the public who asks at a reasonable fee…. And that’s their obligation under the law.” (See Putney vs Elberta January 4 2013 hearing transcript). Sharyn has stated that she offered to print out a copy of the ordinance for Putney when he initially asked for it. If she were to make that same offer to someone now, she would not be printing out a current, updated document; several important changes the Planning Commission has made since the Putney affair began would be missing. It is Council’s job, as the office’s “boss,” to exercise leadership in making employee priorities clear. At the September meeting Reggie Manville finally directed Bower to make the zoning ordinance updates a priority, even if she had to put aside other tasks. A DEDICATED VILLAGE DPW: WORTH IT? In addition to plowing, mowing, providing routine maintenance to village buildings and equipment, overseeing street repairs, tree trimming, streetlights and sewer issues, and acting as ordinance enforcer, Ken Bonney and now, Cory Toms, are on call 24 hours a day in case of water emergencies, and the DPW must check the village’s wells 7 days a week. Until Toms was hired, Ken Bonney did not have the certified help required by state law to do this work. He has been operating for several years now as the Village’s sole protector of our water quality and availability. For this set of duties alone, I as a Village resident and taxpayer want this Village to have its own dedicated Department of Public Works. When I consider the fact that our DPW is the only official body serving as eyes and ears here in the village (we do not have police patrol), I feel their importance even more strongly. In my opinion, Mr. Bonney has proved to be an asset to this village worth far more than he is actually paid. I would urge you all to attend the special meeting on October 10 to learn the cost-cutting measures that are on the table and voice your opinion about the financial future of the Village. Some tough choices must be made. Should an emergency manager be appointed, that manager has the authority by state law to sell Village assets, including its parks; an emergency manager might also dismantle Village commissions, such as Parks and Rec, and fire personnel. We can make these decisions for ourselves, or we can let others do it for us. Changes are coming no matter what. *The most recent legal fees figure I was able to get from Sharyn Bower or any official was back in March, when Bower said in an email that we had paid $8,700 and still owed $30,000. Several hearings and meetings requiring legal counsel have occurred since that time. Council member Diane Jenks today said she did not know how much the village owes in total for legal costs but that we have been on a payment plan of $2,000 per month for some time.